Available fully furnished 1,622 Square Feet, 2 Bedrooms, 2.5 bathrooms, and rare panoramic city and river views are only some of what you will experience in this home at 70 Charlton Street. Flooded with light through the large 7' windows and filled with unique interior features, this residence is the best of what West Soho can offer. Designed by Workshop/ADP and upgraded to perfection, the interiors have many unique features like a large master bedroom with dual walk-in closets and an en-suite bathroom, an open kitchen boasting top-of-the-line Miele appliances, a custom SubZero wine fridge, Caesarstone Blizzard slab countertops, and painted steel trim and grey washed oak floors. This home also includes a large second bedroom accompanied by its own full bathroom, a powder room with Quarter-cut teak millwork, washer/dryer machines, and extraordinary closet space. 70 Charlton Street by Extell Development consists of 92 luxury apartments. Award-winning architects, Beyer Blinder Belle, used the complex notes from the surrounding area to create the invigorating design for this property. This property consists of an exuberant amount of amenities: 24-hour doorman/concierge; resident manager; landscaped courtyard with green wall, birch tree arbor, staggered boxwood garden, water feature; outdoor sports court; 60' indoor saltwater swimming pool; fully-equipped fitness room; steam room; residents' lounge with catering kitchen; kids playroom; package room with large refrigerator for fresh food & flower deliveries; bicycle and storage available.70 Charlton Street is beautifully positioned between SoHo, Tribeca, and the West Village, which offers a unique opportunity to decide your experience with just a few steps. 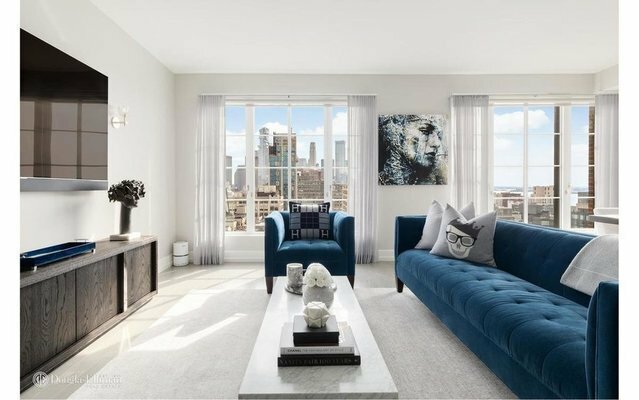 Located below West Houston Street, and only a short walk from Hudson River Park, the neighborhood is surrounded with endless dining, retail, fitness, and entertainment destinations.